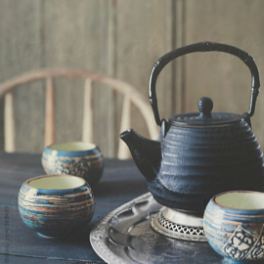 A 2011 systematic review of 1851 women taking Chinese herbal medicine (in a variety of studies of varying quality) found a 2-fold improvement of pregnancy rates over four months compared to Western medicine. They also found that a crucial factor is the quality of the menstrual cycle: something Chinese traditional medicine has emphasised for centuries in its diagnostic approach. (also see an update of this research done in 2015, below). This is a systematic review that meets the criteria for inclusion on DARE (Database of Abstracts of Reviews of Effects); Centre for Reviews and Dissemination, University of York. 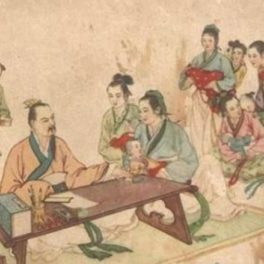 To assess the effect of Traditional Chinese Herbal Medicine (CHM) in the management of female infertility and on pregnancy rates compared with Western Medical (WM) treatment. We searched the Medline and Cochrane databases and Google Scholar until February 2010 for abstracts in English of studies investigating infertility, menstrual health and Traditional Chinese Medicine (TCM). We undertook meta-analyses of (non-)randomised controlled trials (RCTs) or cohort studies, and compared clinical pregnancy rates achieved with CHM versus WM drug treatment or in vitro fertilisation (IVF). In addition, we collated common TCM pattern diagnosis in infertility in relation to the quality of the menstrual cycle and associated symptoms. Eight RCTs, 13 cohort studies, 3 case series and 6 case studies involving 1851 women with infertility were included in the systematic review. Meta-analysis of RCTs suggested a 3.5 greater likelihood of achieving a pregnancy with CHM therapy over a 4-month period compared with WM drug therapy alone (odds ratio=3.5, 95% CI: 2.3, 5.2, p<0.0001, n=1005). Mean (SD) pregnancy rates were 60±12.5% for CHM compared with 32±10% using WM drug therapy. Meta-analysis of selected cohort studies (n=616 women) suggested a mean clinical pregnancy rate of 50% using CHM compared with IVF (30%) (p<0.0001). Our review suggests that management of female infertility with Chinese Herbal Medicine can improve pregnancy rates 2-fold within a 4 month period compared with Western Medical fertility drug therapy or IVF. Assessment of the quality of the menstrual cycle, integral to TCM diagnosis, appears to be fundamental to successful treatment of female infertility. To assess the effect of Traditional Chinese herbal medicine (CHM) in the management of female infertility and on pregnancy rates compared with Western medical (WM) treatment and update previous meta-analyses. The aim of this systematic review is to assess the effectiveness and safety of Chinese herbal medicine (CHM) in treatment of anovulation and infertility in women. Eight (8) databases were extensively retrieved. The Chinese electronic databases included VIP Information, CMCC, and CNKI. The English electronic databases included AMED, CINAHL, Cochrane Library, Embase, and MEDLINE®. Randomized controlled trials using CHM as intervention were included in the study selection. The quality of studies was assessed by the Jadad scale and the criteria referred to Cochrane reviewers’ handbook. The efficacy of CHM treatment for infertility with anovulation was evaluated by meta-analysis. There were 692 articles retrieved according to the search strategy, and 1659 participants were involved in the 15 studies that satisfied the selection criteria. All the included trials were done in China. Meta-analysis indicated that CHM significantly increased the pregnancy rate (odds ratio [OR] 3.12, 95% confidence interval [CI] 2.50–3.88) and reduced the miscarriage rate (OR 0.2, 95% CI 0.10–0.41) compared to clomiphene. In addition, CHM also increased the ovulation rate (OR 1.55, 95% CI 1.06–2.25) and improved the cervical mucus score (OR 3.82, 95% CI 1.78–8.21) compared to clomiphene, while there were no significant difference between CHM and clomiphene combined with other medicine. CHM is effective in treating infertility with anovulation. Also, no significant adverse effects were identified for the use of CHM from the studies included in this review. However, owing to the low quality of the studies investigated, more randomized controlled trials are needed before evidence-based recommendation regarding the effectiveness and safety of CHM in the management of infertility with anovulation can be provided. Reprod Biomed Online. 2015 Jun;30(6):602-12. doi: 10.1016/j.rbmo.2015.02.005. Epub 2015 Feb 24. Patients undergoing IVF may receive either acupuncture or whole-systems traditional Chinese medicine (WS-TCM) as an adjuvant IVF treatment. WS-TCM is a complex intervention that can include acupuncture, Chinese herbal medicine, dietary, lifestyle recommendations. In this retrospective cohort study, 1231 IVF patient records were reviewed to assess the effect of adjuvant WS-TCM on IVF outcomes compared among three groups: IVF with no additional treatment; IVF and elective acupuncture on day of embryo transfer; or IVF and elective WS-TCM. The primary outcome was live birth. Of 1069 non-donor cycles, WS-TCM was associated with greater odds of live birth compared with IVF alone (adjusted odds ratio [AOR] 2.09; 95% confidence interval [CI] 1.36 to 3.21), or embryo transfer with acupuncture only (AOR 1.62; 95% CI 1.04 to 2.52). Of 162 donor cycles, WS-TCM was associated with increased live births compared with all groups (odds Ratio [OR] 3.72; 95% CI 1.05 to 13.24, unadjusted) or embryo transfer with acupuncture only (OR 4.09; 95% CI: 1.02 to 16.38, unadjusted). Overall, IVF with adjuvant WS-TCM was associated with greater odds of live birth in donor and non-donor cycles. These results should be taken cautiously as more rigorous research is needed. Objective: To highlight a natural approach to coexisting oligomenorrhea, subfertility, luteal phase insufficiency and multiple fibroids cohesively when in vitro fertilisation (IVF) has failed. A 43-year-old woman with diminished ovarian reserve and multiple uterine fibroids had previously been advised to discontinue IVF treatment. 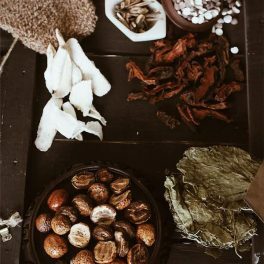 According to Chinese Medicine diagnosis, herbal formulae were prescribed for improving age-related ovarian insufficiency as well as to control the growth of fibroids. After 4 months of treatment, the patient’s menstrual cycle became regular and plasma progesterone one week after ovulation increased from 10.9 nmol/L to 44.9 nmol/L. After 6 months, she achieved a natural conception, resulting in a live birth of a healthy infant at an estimated gestational age of 40 weeks. Conclusions: The successful treatment with Chinese Herbal Medicine for this case highlights a natural therapy to manage infertility due to ovarian insufficiency and multiple fibroids after unsuccessful IVF outcome.